The Carolina Region is pleased to announce the following individuals as recipients of 2018 Robert L. Lindsay Meritorious Service Awards. A listing of all previous winners of Carolina Region Meritorious Service Awards can be found here. Brian Jones –Brian has been a Carolina Region referee since the 2006 season. He achieved his Junior National Rating in 2010. He achieved his National rating in 2014. He has served on the Carolina Region Rating and Training team. 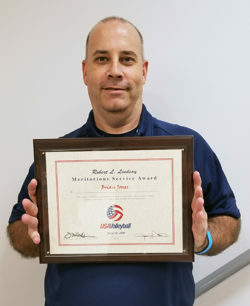 Brian has been highly involved in the Mid-Atlantic Volleyball Officials Board and is has worked to improve officiating and line-judging for USAV and Collegiate officials. Brian was also recognized by PAVO with a Meritorious Service award in 2018. Trey Mainwaring – Trey has been playing volleyball in the Chapel Hill area for years. 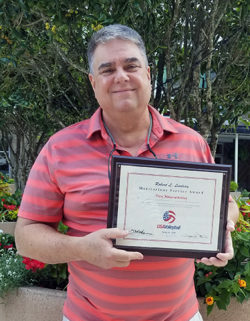 In 2008, he became a coach with the Chapel Hill Area Volleyball Club to pass along his love of the game to the next generation. Trey was elected as the Junior Girl's Rep to the Carolina Region Board of Directors in 2014 and served in that capacity through 2018. 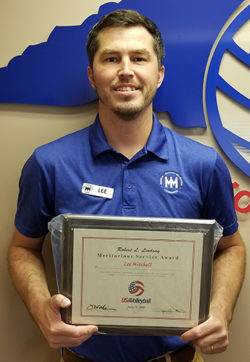 Lee Mitchell – Lee has served as a Club Director and Tournament Director in the Carolina Region since 2015. He formed the Carolina Spikeforce in Greensboro at the local YMCA where he worked. When a call went out for sites to host tournaments, Lee stepped forward and hosted several tournaments at his facility. Two seasons ago, Lee branched out to outdoor volleyball and began hosting outdoor tournaments for local players. Lee has recently moved to Mayodan and is already connected to a club in the area for both indoor and outdoor events.